Can a performance mattress truly meet the demands of my active lifestyle? Brooklyn Bedding created Spartan Mattress because of customer demand for a luxury mattress geared towards recovery and performance. Implementing design features and using the company's proprietary foam formulations, Spartan comes equipped with Nanobionic RE-3™ technology. This material has been clinically tested and the company reports the potential for faster recovery, shorter time to fall asleep, and overall improved sleep health. 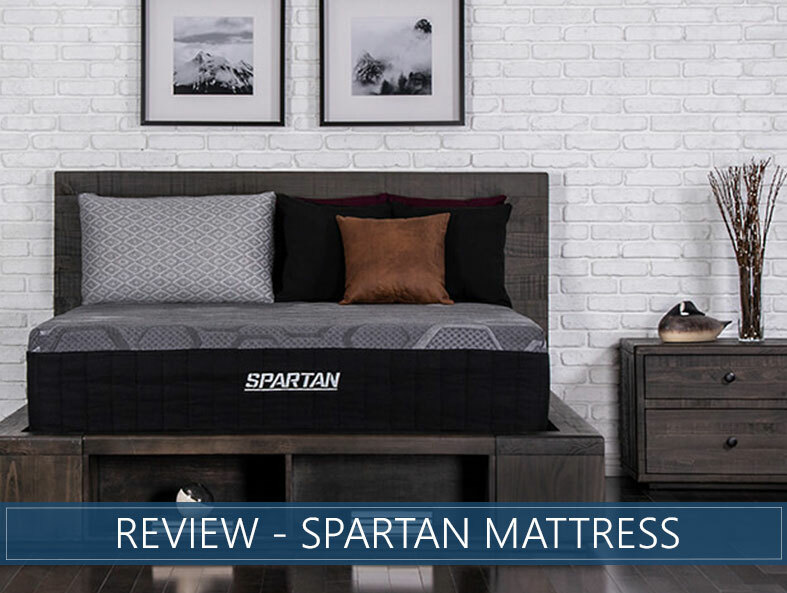 Our in-depth overview of the Spartan mattress will analyze the company's claims by scoring this bed based on features such as cooling, comfort, support, and overall purchase value. This analysis specifically looks at the Medium option of this product. If you are interested in our full review keep on reading but if you would rather skip ahead to our scoring and summary, click here. Live an active lifestyle – The manufacturer claims that the Nanobionic RE-3™ technology incorporated into this bed reportedly delivers energy back to the body. This should help so your anatomy can rest better, allowing you to wake up with increased amounts of renewed energy. Enjoy bounce – If you appreciate the bouncy sensation of coils mixed with responsive foams you should get a kick out of this mattress. It provides simple repositioning and can be great for sexually active couples. Sleep hot – A combination of materials like cooling gel, copper infused foams, and a breathable coil layer, should leave you sleeping cool throughout the night. Desire an all foam bed – Supporting the foams in this mattress is an 8-inch layer of pocket coils that give this bed more bounce than a traditional memory option. This bounce eases repositioning while providing some of that memory foam feeling the top 3 comfort layers have to offer. Spartan was designed as a hybrid to be compressed and shipped in a box. The mattress includes handles on the sides for easy installation. It can be set on a variety of foundations: platforms, base, boxspring, and adjustable bases. Foundations designed specifically for Brooklyn Bedding products can be found on their website. The performance cover is made of patented Nanobionic RE-3™ technology, a material currently under investigation by scientists to prove it’s long-term health benefits. The company claims that this tech recycles body heat by transforming it into waves of energy that are transmitted back into the body. This is said to happen through the fibers in the cover, providing the body with increased levels of oxygenation, improved circulation, sleep quality, and overall wellness. This hybrid design towers at 13.5 inches tall. Spartan incorporates the best aspects of coils and foam, delivering optimized comfort and support. The first layer is 1.5 inches of CopperGel Energex™ with TitanCool™. This extremely responsive foam fosters pressure relief that should remain cool because the conductive gel transfers heat away from the body. 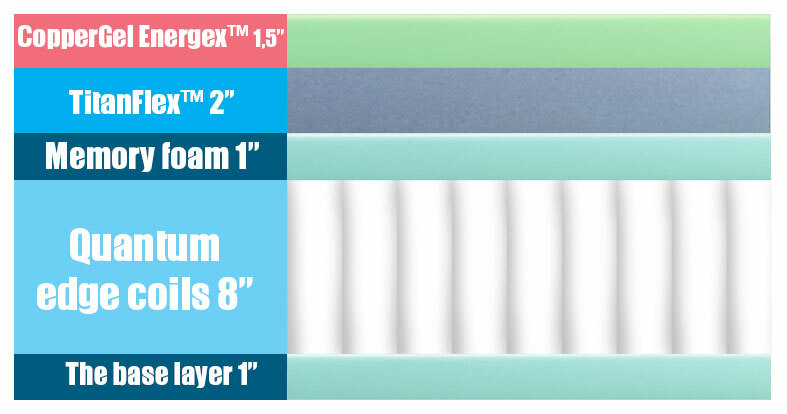 The second layer is 2 inches of TitanFlex™ technology. This super strong material provides additional contouring with an increased bounce that should adjust to the body with every movement. This is an alternative to latex that is great for sleepers who suffer from latex allergies. The third layer is 1-inch of swirl visco-elastic memory foam, which functions as a transition between the foams and pocket coils, providing deep contouring and increased pressure support. This material includes embedded gel for additional cooling. The fourth layer is 8 inches of Quantum edge coils that add edge-to-edge stability and support. The coils outlining the perimeter are reinforced to equip the edges with increased structural integrity. The base layer is 1 inch of protective foam that supports the weight of the mattress and protects it from damage. The Medium firmness of Spartan scored at a 5 out of 10 on our firmness scale, with a score of 10 being the firmest. Brooklyn Bedding markets two additional firmness options, the Firm and the Soft, which we have rated at 7 and 3, respectively. The breathable cover keeps the body from overheating and feels cool to the touch. Initially, when lying down you should notice that your body sinks into the top three layers, leaving you resting in a gentle cradle. Spartan does not permit too much sinkage and most layers respond quickly to pressure. The Quantum coils influence deep bounce that leaves you feeling comfortable, while the TitanFlex™ adds buoyancy in the top comfort layers. The combination of these materials makes an easier time for repositioning (combination) sleepers. Back sleepers should experience spine alignment supported by the pocketed coils while benefiting from the contouring in the lumbar regions provided by the foam comfort layers. For those folks that like a little extra support they might enjoy the firmer option of this model. Side sleepers lie down with their weight concentrated upon a smaller surface area, causing many to experience increased pressure in the hips and shoulders. This bed should cradle these areas for a desired relief of strain, while the pocket coils help maintain spinal alignment. Side sleepers desiring further pressure relief might want to consider the Soft model of this product. Stomach sleepers frequently experience sinkage down in their hips, which may cause misalignment in the spine. Most of these individuals should feel adequately supported while using the Medium firmness, but those who have heavier weights to consider may be better suited towards the Firm model. This should be a good choice for people of almost all weight considerations. Because of the 13-inch height and enhanced support that the hybrid technology provides, heavy sleepers should never worry about bottoming out this sleeping option. Some folks share a bed and if either partner is a light sleeper a mattress with good motion transfer may be something you wish to consider. Spartan performs fairly well with motion isolation because of its pocket coils and transitional memory foam. Pocket coils are wrapped and separated to help keep motion secured in one spot and memory foam’s motion isolation properties have earned it a great reputation within the industry. You may experience slightly more motion transfer on this bed than on an all memory foam model, but rest assured knowing it isolates motion well for a hybrid bed with springs. Couples take up more sleeping surface space, so strong edges will benefit those who need to use the entire mattress. This product scores high in this category, especially in comparison to other bed-in-a-box options like an all foam bed. Stronger coils along the perimeter reinforce the edge-to-edge coil system. This should guarantee you are well-supported even if you wind up getting pushed to the edge by your partner. You should feel the strong support of the coils beneath you even with your weight concentrated in a sitting position on the side of the mattress. Trial Period – This bed has a 120-Night trial and if the product fails to satisfy your expectations you can adjust your order or return your product for a refund. Warranty – The brand provides a 10-year warranty when purchasing this product. Shipping – Shipping is free inside the contiguous United States. This product can be delivered to Hawaii, Alaska, or Canada for an added service fee. CertiPUR-US® Certified – The foams in this product were made without the use of ozone depleters and was certified free from harmful amounts of toxic materials, including but not limited to, formaldehyde, mercury, lead, and other metals. This hybrid construction provides a luxury experience while answering the needs of sleepers who live an active lifestyle. The tech in this mattress could potentially help with recovery and overall sleep quality. Spartan has incorporated features from some of Brooklyn Bedding other signature mattresses but targeted their design towards athletes and active sleepers. This bed’s overall design is a great option for those wanting to recover, sleep cool, and experience a bed with a little more than average bounce. If you are interested in the cover technology, we encourage you to research Nanobionic RE-3™. Brooklyn bedding designs and manufactures their products. This enables them to advertise fair and affordable prices for their customers by cutting out the middlemen. Overall, this bed delivers comfort and support that incorporates advanced tech that will only continue to grow! The Benefits of Exercise For Sleep – Does It Help With Insomnia? 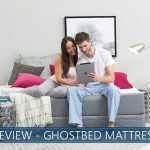 An Honest GhostBed Review - The One You've Been Waiting For?